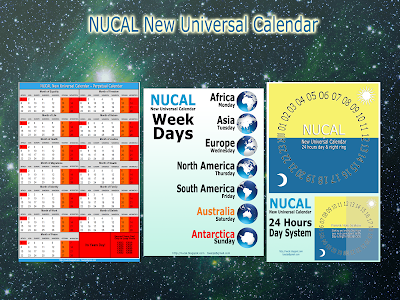 NUCAL is a proposal for a rational reform of the present Gregorian Calendar. A NUCAL Year consists of 13 months each of 28 days and each with 4 weeks of 7 days. NUCAL also proposes changing the Era convention and the starting and ending hours of the day. 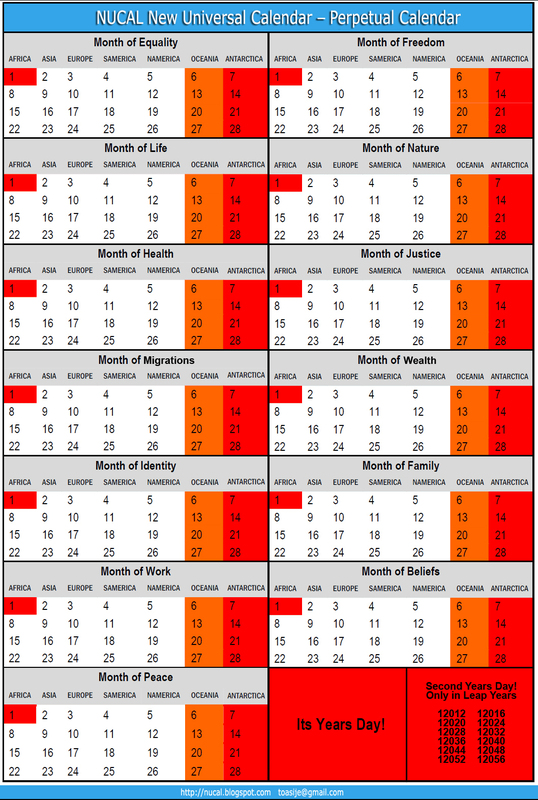 The New Universal Calendar is a proposal for a total reform of the internationally accepted Gregorian Calendar, Based on Julian Calendar (see about calendars). NUCAL Is a regular, easy to remember, non religious and non anti-religious stable way to organize time segments. NUCAL consists of 13 month each of 28 days and 4 weeks of 7 days, there is also a day not belonging to any month called Years Day. NUCAL also promotes changing the current Christian Era with historical dates in negative with the obsolete roman notation system of centuries, to the superimposed Eras system and the centurial notation. 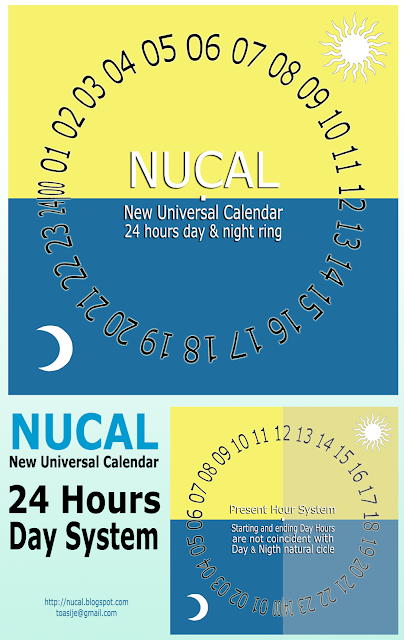 Finally NUCAL promotes a change in the starting and ending hours of the day. The Era of History (EH) Starting on 10.001 b.c. The Era of Homo Sapiens (EO) Starting on 100.001 b.c. The Era of Mankind (EM) Starting on 1,000.001 b.c. No negative dates anymore. Very simple! Go here to see & download images! This is just an initiative to promote a change of Gregorian Calendar for more efficient and rational living. Since the beginning of Human thinking, Mankind has organized the time into segments to rule the common life, this is what we call calendars. The sideral cicles make it difficult to establish regular and divisible leaps of time. Mesopotamian and Egyptian calendars had important inaccuracies, same to say about the lunar calendars wich did not match with the solar year. 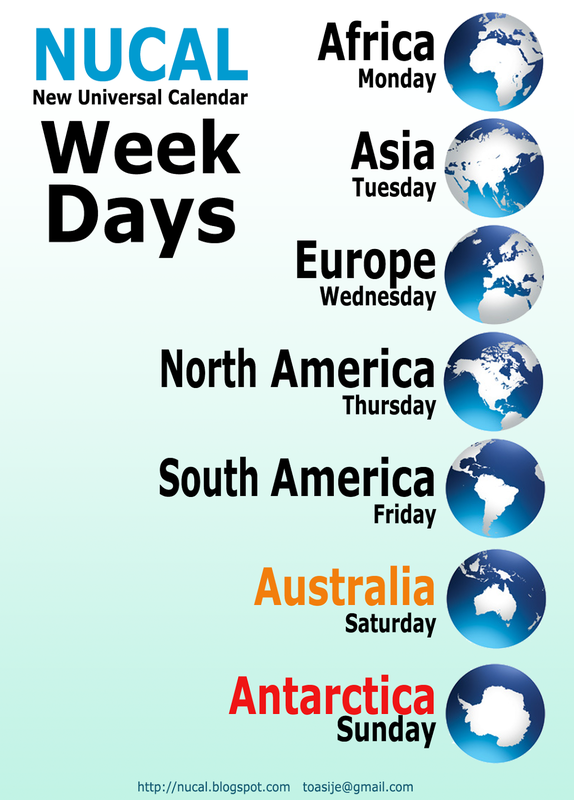 The solar year called Tropical Year itself is not "perfect" composed of 365 days, 5 hours, 49 minutes and 30 seconds. Despite this difficulties some peoples notably the Mayan Civilization succeded in creating a regular, but very complex, divission of time. 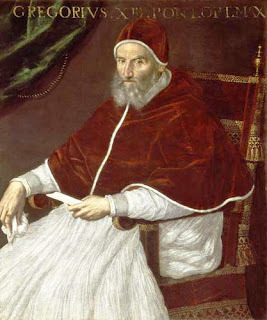 The actually most whidely accepted Calendar, the Gregorian was introduced by Pope Gregory XIII, by a decree signed on 24 February 1582, the papal bull Inter gravissimas. The calendar was adopted later that year by a handful of countries, with other countries adopting it over the following centuries. The Gregorian calendar introduced some reforms to the previous Julian calendar and also to the lunar cicles. This calendar has been ruling the lives of most of the countries with little contestation despite some errors, some inaccuracies and over all the very obvious intrinsic irregularities. The main critics came with the French Revolution and later with the positivistic movement. One of the latest proposed reforms to the Gregorian calendar is the International Fixed calendar (also known as the International Perpetual calendar, the Cotsworth plan, the Eastman plan, the 13 Month calendar or the Equal Month calendar) this proposal provides a year of 13 months of 28 days each, with one day at the end of each year belonging to no month or week. The International Perpetual calendar is based on the Positivist Calendar published in 1849 by French philosopher Auguste Comte (1798-1857). Comte based his calendar on Polynesian calendars, unfortunatelly other Comte's ideas where dismisible and linked to racism. The idea continued with the International Fixed Calendar League, it was founded in 1923 by Moses B. Cotsworth, with offices in London and later in Rochester, New York, but it ceased activities in the 1930s. Some say a calendar is only a social convention and its importancy is only psicological. But the fact is that calendars will continue to rule several aspects of our lives, specially work time, weekends and holidays, international and local commerce, industry, students life, and spare time. If the Gregorian calendar is inaccurate or irregular this contributes to irregularities and innaccuracies in all those mentioned fields, and this can lead to less quality of life. Feel free to share this images!